Crystals could be the solution to cooling the every more powerful electronics that are generating ever more heat which must be drawn away to stop dangerous overheating. Copper has been a typical heat sink for many personal computers while fans, air, or liquid cooling have also been employed in the office, home, or at the datacentre. Too large for small electronic devices, fans and liquid cooling are complex and require power supplies, while copper has a finite rate of heat absorption. Silicon can dissipate heat, hence the use of air, but silicon’s thermal conductivity is limited at 150 watts per meter-kelvin. The higher the number of watts, the better the cooling is. Researchers have created a boron arsenide crystal with a conductivity of 1,000 watts per meter-kelvin. “If you have it [watts per meter-kelvin] in the high 500s you can commercialise [a material as a heat sink],” said Bing Lv, an assistant professor of physics in the School of Natural Sciences and Mathematics at University of Texas Dallas. Lv is one of the leading researchers developing boron arsenide crystals. He explained that while diamond has the highest thermal conductivity at about 2,200 watts per meter-kelvin, its cost makes it impractical for everyday use. 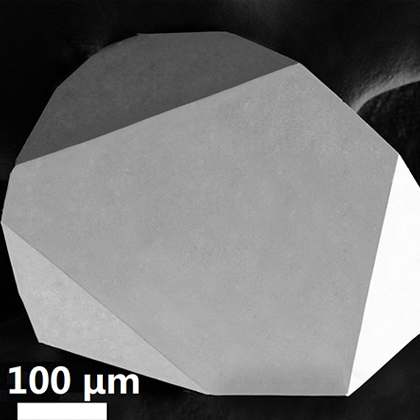 Lv’s boron arsenide crystals have the next highest thermal conductivity after diamond. As boron arsenide is a semiconductor, comparable to silicon, it can be incorporated more easily than other materials into semiconducting devices. Boron arsenide is also an insulating material and therefore it can be in contact with the electronics, like copper, and no current will pass through, only heat. In 2015, Lv and his then colleagues at the University of Houston produced boron arsenide crystals with a thermal conductivity of about 200 watts per meter-kelvin. While the researchers have now achieved 1,000 watts, “I think we can even push it higher, likely we can get it higher, the theoretical prediction is 1,300 [watts per meter-kelvin for silicon],” Lv said. The 1,000 watts per meter-kelvin for silicon crystals are made through the careful control of a process called chemical vapor transport. The boron and arsenic are placed in a vacuum chamber that is hot at one end and cold at the other. Inside the chamber, at the hot end, the arsenic sublimes into a gas to fill the chamber’s volume. Another, unspecified, chemical transports the boron to the cooler end, where the boron and arsenide combine to form the 100-micron crystals. Lv explained that: “It requires time and very careful manipulation of many parameters such as gas pressure and temperature and temperature gradient,” to create the more thermally conductive crystals. The way heat is dissipated in boron arsenide due to the vibrations of the material. As the crystal vibrates, the motion creates packets of energy within its crystalline structure called phonons. Phonons are quasi-particles that carry heat. The crystalline structure and the mass difference between the boron and arsenic atoms help the phonons travel quickly from the heat source, giving the crystal its high thermal conductivity. While arsenic is poisonous to people, combined with boron, it is non-toxic. The next stage of Lv and his colleagues work will be experimenting with other manufacturing processes to improve the growth and properties of boron arsenide for large-scale use. As well as Lv’s University of Texas Dallas researchers, teams at the University of Illinois at Urbana-Champaign and the University of Houston. The researchers work has been supported by the United States’ Navy’s Office of Naval Research and the US government’s Air Force Office of Scientific Research.